Black Salt is used in spells and rituals involving banishing magick, as added protection against negative energy and to remove hexes and jinxes. 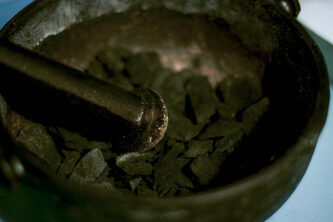 Black Salt may be sprinkled around your home or property, added to banishing sachets, incenses, and herbal mixtures. A little Black Salt goes a long way. Of course you may purchase Black Salt but it is much more powerful to create your own. Burn banishing herbs on a charcoal disc inside your cauldron. Allow the charcoal and herbs to burn down completely. Scrape the inside of your cauldron with a sharp spoon or knife. Crush the scrapings in a mortar and pestle then add plain white salt or natural sea salt. Use about twice the amount of salt as scrapings. Crush and mix the salt and scrapings together while concentrating on banishing energies. Put the newly created black salt into a little jar and label it.